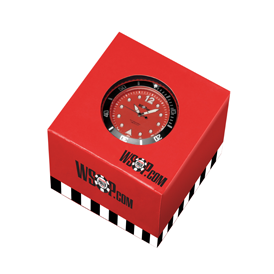 Create your own custom box and gain more space to tell your promotional story! We use your artwork to create a uniquely custom box. Client's graphics printed on the box is available starting at 250 pieces. Other packaging options include tin canisters, classic boxes, and more. Please call for more information. Adds to the per piece price of selected Lolliclock. Set up fee is waved at quantities of 1,000 or more. Allow 3 weeks after art approval. For production quality boxes, sample cost is $300.00 (G), non-refundable. 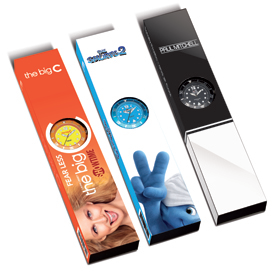 For mock-up quality, sample cost is $40.00 (G) non-refundable.